TOPLid is the ultra compact tray-sealer by Gruppo Fabbri, known for its performance and simplicity of use. Fully automatic, it is particularly suitable for packing food products in a protective atmosphere, particularly meat, thanks to the patented gas exchange system. The compact size, high productivity and simplicity of use makes this machine unique. The unique design of the punching tool makes it extremely light, allowing format replacement easier for everyone. Also available in a version completely made of steel, TOPLid can be used both in supermarket and medium to large-size packaging centres. TOPLid occupies approximately 1.6 x 1.6m of surface area and offers a packaging speed of up to 40 trays per minute in a double-line version. It is the only tray-sealer in the world to offer these benefits with such small dimensions. Patented gas exchange system: perfect mixture, always! Thanks to the innovative gas exchange system, TOPLid can handle mixtures with residual oxygen lower than 0.3%, without resorting to expensive systems equipped with vacuum-gas pumps. Moreover, there is no need for special and expensive power systems in the presence of high percentages of oxygen. TOPLid is available in both blue safety guard and stainless steel safety guard versions, to give you the opportunity to always have the right machine in the right place. Format change: in less than 4 minutes! And in complete safety. The format change is managed by touch-screen monitors wherein operators can follow a simple, step by step instruction. In addition, the positioning of the various parts is controlled by the machine at different times, effectively excluding the possibility of making errors. Great attention has been given to the operator at this delicate stage: the limbs of the staff will never come in contact with the critical parts such as sealer tools and blades, so that each format change can take place in complete safety. Ring road or highway: the choice is yours. TOPLid can be ordered with a double-line configuration, a solution that exploits the maximum potential of the machine. This configuration can be easily converted to a single-line version by simply changing the punching tool and the programme. It only takes the same time as changing the format; you will have a machine available that can package different types of trays at the most suitable speeds. Unique! Monitor touch-screen: more beautiful in colour. Simple and intuitive interface to control all machine functions with a simple touch. Everything, multi-lingual and coloured. TOPLid, in conjunction with the best performing film in the market, ensures excellent sealing even at maximum speed, guaranteeing the highest safety standards to clients. TOPLid provides the best performance with PE-Lid 22, a 5-layer high barrier film, specially developed for tray sealer machines by Gruppo Fabbri. Suitable for any tray, in every way. The automatic power of TOPLid allows packaging of trays without any need for prepositioning or spacing at the entrance, typical on traversing bar machines. It can also handle the same format with different heights at the same time, thanks to the mobile punching tool that brings the tray under the sealing station. TOPLid, like all packaging machines of Gruppo Fabbri, features several access points to various mechanical parts, thanks to the semi-covers that can be opened; the two front panels and the exit safety guards. This guarantees utmost simplicity and speed during periodic cleaning and regular maintenance. The panel containing the electronic and pneumatic units has an IP54 degree of protection and is located at the rear of the machine, ensuring total protection. 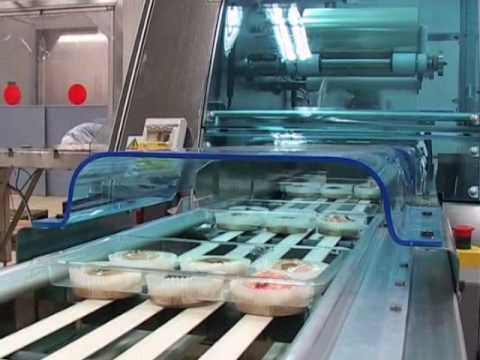 TOPLid can package trays with protruding products, all those products that for reasons of presentation or management extend beyond the edge of the tray. Thanks to the dedicated optional feature, TOPLid can offer a protected atmosphere solution with an attractive fresh appearance. It is also special in this regard.